Why are counter-terrorism police treating fracking opponents as ‘extremists’? The mother of a young anti-fracking activist, who took part in protests against Raithlin Energy’s shale gas exploration well at Crawberry Hill in East Yorkshire, is demanding to know why counter-terrorism police visited her home to ask about her son’s alleged “involvement with extremists”. Late last year, two ‘Prevent Team’ officers from Lancashire Police turned up unannounced on the doorstep of Jacob’s* parents near Blackburn, asking to come in and discuss his involvement in anti-fracking protests. Jacob’s mother told them that he no longer lived at home and if they were concerned about him, they should speak to him directly. Both officers were asked not to return. However, a few days later one of the officers, a WPC, was back at the house with a different colleague, again unannounced. Jacob’s mother was again questioned about whether she had seen or spoken to her son. When she asked why the police were investigating him, the female officer told her that they “just wanted to make sure he knew what kind of people he was involved with as they are extremists.” Jacob’s mother replied that as her son is twenty years old, he is able to make up his own mind. Neither officer was allowed into the house, but the conversation was captured on video. ‘Prevent’ is one of the four strands of the UK’s counter-terrorism strategy CONTEST. The government says it covers “all forms of terrorism, including far right extremism and some aspects of non-violent extremism”, but it is also clear that the latter refers to groups who are “knowingly creating an environment in which people can be drawn into terrorism itself”. Overwhelmingly it has targeted surveillance against Muslim communities and in the process has so alienated many British Muslims that one senior officer recently called Prevent a ‘toxic brand‘. As Jacob’s mother has told us that she was initially contacted by social services, it seems likely that her son was targeted through a secretive counter-terrorism programme called Channel, led by the police but involving a local multi-agency ‘safeguarding’ panel. Channel is, according to government guidance ( , 534 kB), intended to ‘support’ children and adults at risk of being drawn into terrorism “based on an assessment of their vulnerability”. One of the ‘behaviours’ that are indicative is “spending increasing time in the company of other suspected extremists”. So why are Prevent officers equating opposition to fracking with terrorism and extremism? We know that public order commanders have chosen anti-fracking protests as the focus of their training and there is other evidence of intimidatory visits by police to the homes of campaigners. “The other guy who was sitting opposite me, was watching what I did, checking everything out in the room, and he would randomly interrupt quite bluntly with questions like: who am I involved with? What groups am I the leader of? Who have I been in contact with? Who owns the house? 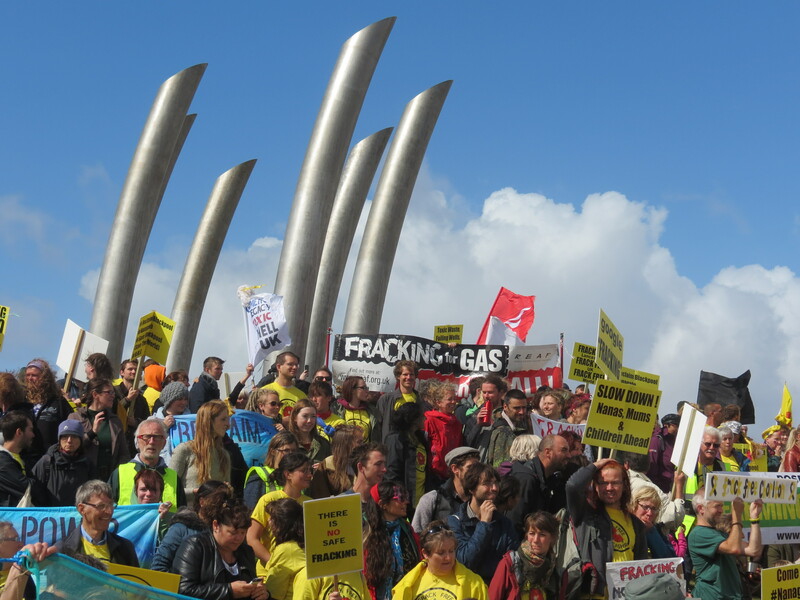 What is my involvement in the anti-fracking scene? What is my interest in fracking? I found the scenario quite intimidating”. At the time there was no anti-fracking group in Chester but John had written to his local paper about plans for an exploratory drill at Upton, attended a public meeting organised by Left Unity and afterwards arranged to chat with others concerned about fracking who had also attended the meeting, at a pub in the town. He was unable to tell the officers anything, so they left a card and asked John to call “if heard of anyone planning any sort of trouble”. It wasn’t until several weeks later that he found out about the construction of a drilling site at nearby Farndon. Crucially, however, John had made several day trips to the drill site at Barton Moss in Salford and so potentially had spent time “in the company of other suspected extremists”. John is still uncertain about exactly why he was targeted. The clumsy attempt to recruit him as an informant is, however, similar to documented evidence of pressure on Muslims by counter-terrorism officers. In their recent judgement on retention of surveillance data by the police, the Supreme Court insisted that material gathered by officers is “not used for political purposes or for any kind of victimisation of dissidents”. Understandably, a growing number of anti-fracking activists are increasingly likely to disagree. I had em pull the same crap when I attended an AR demo 2 years ago, I am 30 YEARS OLD , this is to be frank police harassment and should be treated as such. They also tried to get let into my house without consent or a warrant. Because they had no legal recourse they asked a neighbour if I had given them a key.